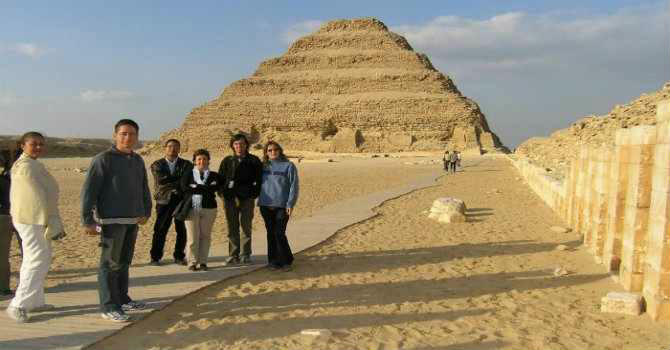 We will pick you up from your cruise docking in Port Said with personal tour guide to explore Giza Plateau. Home of ancient world’s only remaining wonder including the Great Pyramid of Cheops, Chephren and Mykerinos with the mysterious Sphinx and the Valley Temple attached to Chefren pyramid complex. Get your lunch meal in local restaurant then continue to to Saqqara, Egypt's most enormous ancient cemetery where the world's first monumental stone structure of king Zoser is built. the Step Pyramid of King Zoser has been designed by the genius architect Imhotep, you will also explore some Mastaba tombs and the Pyramid of Teti. End the day with quick visit to the Papyrus Institute where you will have the opportunity to learn the techniques assumed by ancient Egyptian to do this kind of art and shop for souvenirs before returning back to Port Said.